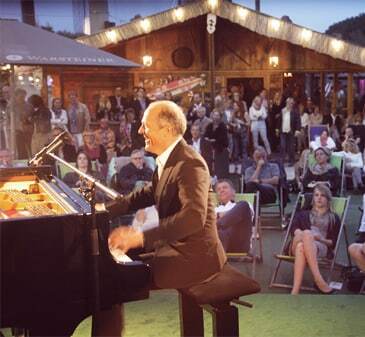 Partys in the “Almhütte” in the Beach Club excessively with cool drinks and activity program — Your guests will love it! The Elbalm (Elbe hut) at the beach club and many other diverse indoor areas offer all kinds of creative and organizational freedom. What can we do for you? 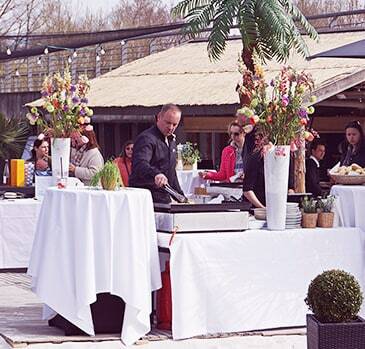 From birthday parties to corporate team events, we will organize an forgettable event for you at the Golf Lounge Hamburg. For your employees, the winter party is one of the highlights of the year. The more exciting the experience, the more they talk about it afterward. 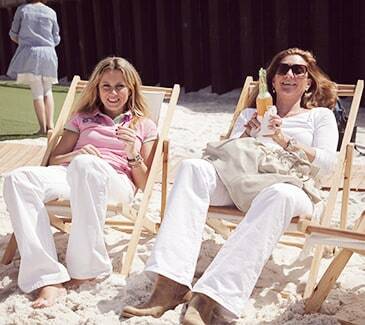 Invite your co-workers and customers to a cocktail at the beach club and to the activity program in the sand! In the Golf Lounge you have both right in front of your office, so to speak. To be remembered by your customers, use the Golf Lounge’s many opportunities: Depending on the occasion you can plan for an exclusive or a rather cheerful day, be it on the tee area or at the beach club. In every case, it will definitely be a memorable experience for everyone. 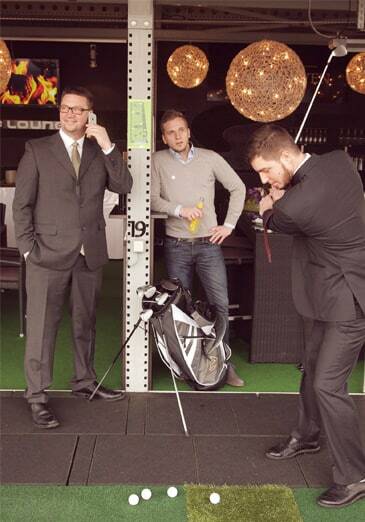 If you can’t afford to travel to Majorca or Sylt just kidnap the bachelor or bachelorette to the Golf Lounge. Be inspired by the many challenges that the husband or wife-to-be has to pass before getting married. With or without the activity program: the drinks are perfect and so is the entertainment. 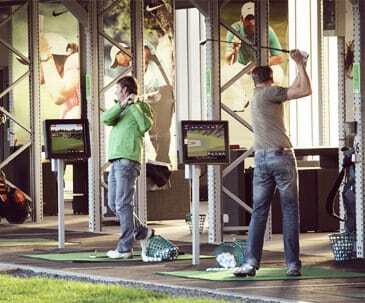 The “Harbor Golf Trophy“ is a special kind of team building event, giving you the ultimate Hamburg experience with three gaming stations right in the middle of the harbor! Be part of the most exclusive harbor boat trip including a golf challenge and award ceremony on the Elbe. We are happy to suggest renowned DJs that understand your guest’s taste in music. And there is even more up our sleeves: clowns for children’s birthdays, salsa teachers for your summer event or a live band for your Christmas party – You name it! 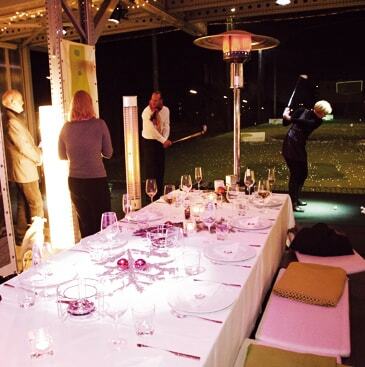 In your exclusive event box you are just by yourselves and practice the swing, or you relax in the high-class lounge with cool music and ambient lighting. If you wish, there will be a professional golfer at your side giving you tips, individually, or train the whole group – why not make it a competition? Casual sportswear, eco-friendly leisure wear, beautiful golf dresses and basics – present your design on the vast runway along the tee boxes on the event floors. The sound system with optional DJ provides every walk with a certain dynamic. 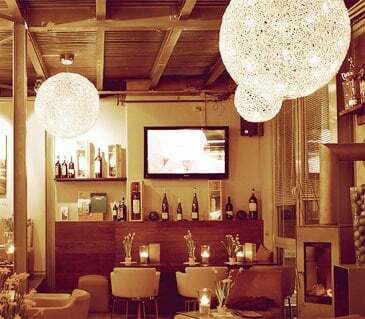 In this loungy atmosphere, your guests will bring full attention to your presentation. The Golf Lounge is the perfect film set. The indoor and outdoor areas are versatile and convertible to sets with or without the golf scenery. The green and the Elbe in the background are great for every picture. Office talk topic number 1 for weeks: Where to go for the next company outing? Surprise your co-workers with a harbor boat trip or a bus ride along the Elbe. 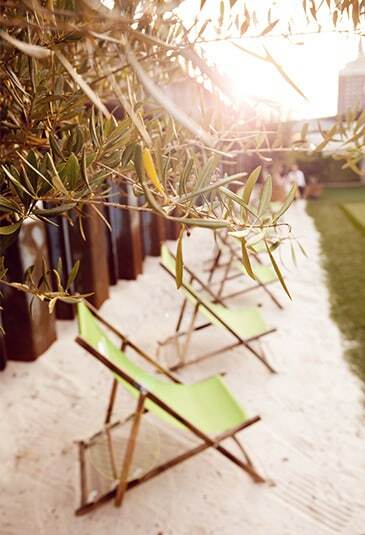 The destination: a fantastic beach club with bar outdoors, miniature golf and great food at the Elbe bridges. Every once in a while, the Golf Lounge presents itself in a new light with a new face. It also offers many possibilities to present brands and sponsors. The golf-gourmet-cup for example or the barefoot-cup deepen our guest’s awareness. We help you plan and implement the brand experience. Celebrate cheerfully with mulled wine, hot punch, and our activity program – Your guests will love it! Hold your conferences, meetings, and presentations in a refreshing work environment. Use your breaks for recreation and go to the tee areas on the same floor just next door – balls and golf clubs included. 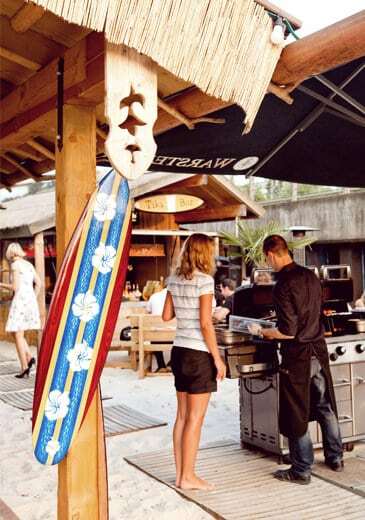 Be it summer or winter – this outdoor bar at the beach club is always open. Enjoy your fruity cocktails and popsicles at your summer party – in the winter the bar converts to a cozy hot punch and mulled wine station for an unforgettable Christmas party. Make a wish for your birthday: We make it come true when it comes to celebrating successfully. We also work our magic with ideas for a cheerful activity program, rustic chalet spirit and holiday atmosphere at the beach club. The event floors in the Golf Lounge offer exclusive VIP boxes in which you and your guest are individually supervised by a professional golfer. We also offer culinary services appropriate for your occasion. It is the best place to slowly close your event for those who are left from the party. During the day, the patio offers an overview of what’s happening but also a great place for having a delicious BBQ. In the Golf Lounge, up to 1000 guests can experience an individual activity program, teeing off, enjoying good food in a great atmosphere and closing the night with people they love. We’d be happy to advise you on the possibilities! 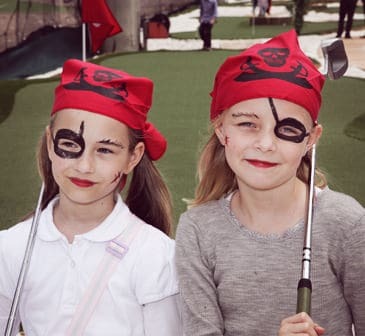 Children’s birthday party, golf lessons, and cold drinks at the beach club – It is up to you! Everyone knows that playing together supports teamwork and thus, we came up with a variety of small and big tournaments for your team building events. The miniature golf trophy for example: With personal training, everyone from intern to CEO will enjoy the fun. We hosted more than 1000 small and cozy, big and spectacular events in the Golf Lounge. But at some point, even the best day is over. That’s why we are very happy when a customer calls back to say “Thank you“. A professional team of event managers, catering pros and sports experts are there for you at all times. They help you prepare, realize and execute your event. 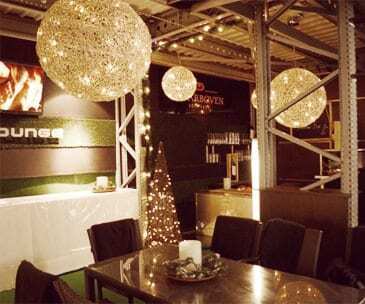 Leave the office and enter the chalet at the Golf Lounge. 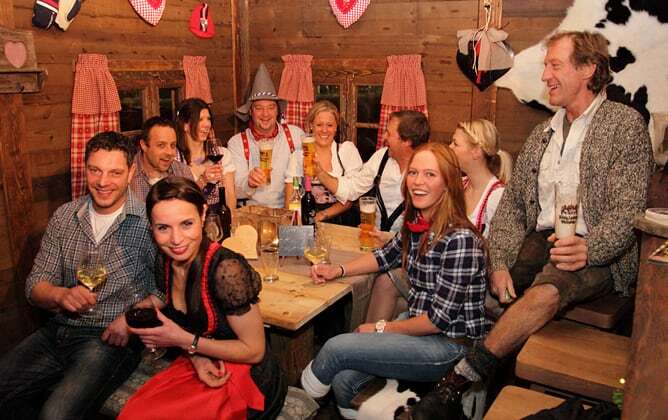 Your guests will remember this private party on quaint wooden benches, a proper wheat beer, and culinary specialties. 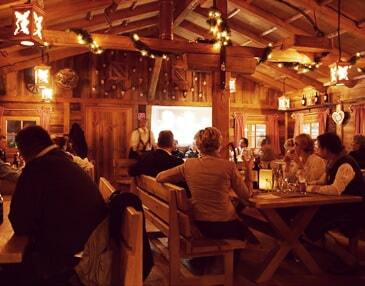 The rustic chalet provides you with a wintry atmosphere the whole year round, regardless of the weather. If you have a special occasion and want to offer your customers, colleagues and their family an exclusive experience, we recommend a combination of activity program and casual BBQ with deliciously grilled meat and savory salads or a joint dinner in the rustic chalet. For best conditions in all weathers. Consider that now is the time to plan for your winter dates. What would your guests like? And what fits the occasion? We are happy to advise you and prepare a delicious brunch or savory BBQ, subtle finger food or large buffet, exciting live cooking or tasteful menu – wide smiles included! Invite your customers or co-workers to one of the most exclusive trips with tons of fun and active challenges. It will be a memorable experience with diverse golfing modules – exciting, communicative and good for team building. Vibrant hosting will be mixed with gaming and rewarding ceremonies in the end. Right from the start we understand what matters most to you. We plan and execute your party and take as much work off your shoulders as you want. Small details, great ideas, and perfect organization — just let us help you and lean back! A competition is always good to loosen up your staff party and bring momentum to the cooperation. For that purpose, the Golf Lounge offers many opportunities, be it on the tee area or the nine-hole golf course — coaches with good ideas included. After that, you may also party actively, of course. 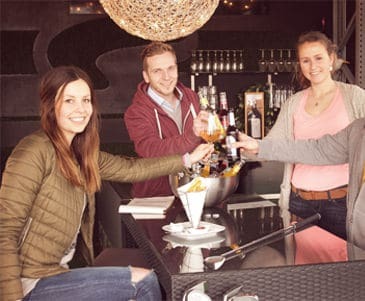 Say yes in South Seas sand – party at the Elbe hut (ElbAlm): In the Golf Lounge, you can have both, right in the city center. On top, you and your newly wedded partner can show your hobby to your family and invite them to play along. You are the birthday boy or girl and you should get the most fun possible out of your day at the Golf Lounge. An experienced professional golfer will show both you and your friends the best tips and tricks in golf. You’ll do short competitions on the driving range, the putting green or in miniature golf. Afterward, you can enjoy your birthday menu with chicken nuggets, smarties cake, and other treats at the lounge or on the sun deck. 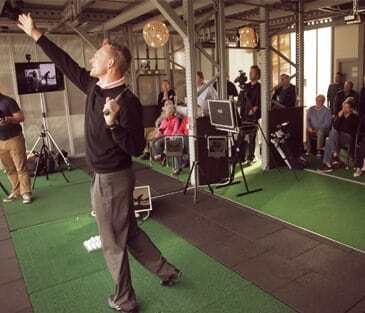 “Meet & golf“ will help to make your customer or employee event a full and effective success. The rustic ambiance with catering service improves focus and concentration – the nine-hole golf course right in front of your door will be a pleasant change during breaks. The Golf Lounge professionals supervise your event from hosting to presenting awards. 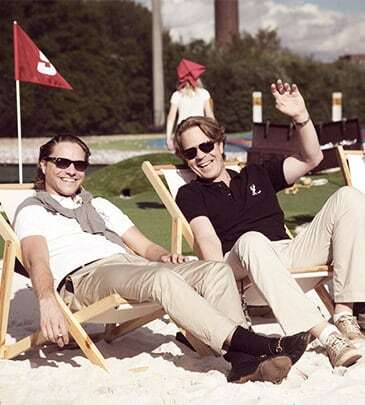 On an activity floor of your choice – be it the Golf Lounge 9 hole course or the Elbe itself in front of Hamburg’s skyline – we turn newbies into golf pros. Discover our golf events! 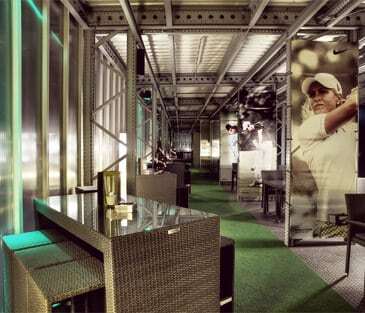 The driving range on three floors is the Golf Lounge’s special feature. The upper area is heated and comfortable regardless of the weather. It has high-quality lounge furnishing, ambient lighting, and a sound system. You can also book a personal trainer if you wish.